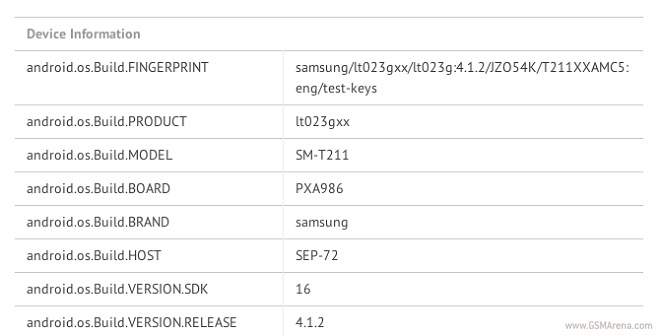 Samsung Galaxy Tab 3 with a new S4-like design was unveiled just yesterday, but the benchmark scores of the tablet have surfaced courtesy of GLBenchmark. According to the benchmark results, the Samsung Galaxy Tab 3 is powered by a Marvell PXA986 chipset with 1.2 GHz dual-core Cortex A9 processor. The SoC is not the most impressive in the market, but is still a significant upgrade when compared to the one powering the Galaxy Tab 2. The latest Galaxy slate comes with GPU Vivante GC 1000, which as the benchmark results confirm, is twice as capable as the PowerVR SGX540 found in the Galaxy Tab 2.So while the CPU performance is probably unchanged, besides the clock difference of 200 MHz, graphics power has seen quite some boost in the latest generation of the Samsung affordable slate. Check out the source link below for the complete insight of the report.